At long last, we are pleased to announce that Clockwork Empires has hit what we are calling Earliest Access – it launches on Friday July 18th, and you can buy it now! Earlier than Early Access, we are continuing our legacy of innovation by daring to release Earlier than any other Early Access developer. So what is this? This is, in fact, the Early Access for Early Access. It’s like Inception. 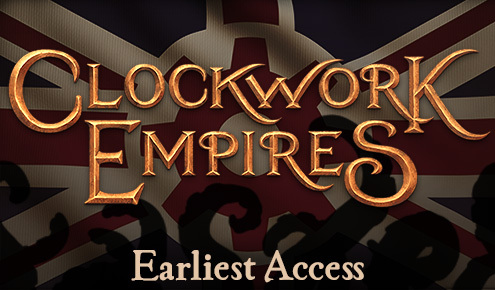 Buying a copy of the Earliest Access build will get you a Steam key, which you can then use to play Clockwork Empires. Your Earliest Access will be upgraded to a copy of the Steam Early Access version when we launch it in August; you will also, subsequently, get the finished game when it’s done. An overview of the current status of the Clockwork Empires project as a whole can be found here, and we will be regularly updating that page at the same time as the major game content updates so you can see how far along we are. We will also of course continue to update our development blog, send update emails to people on the mailing list that want them, tweet about development here, and participate in forum discussions here. Earliest Access is our opportunity to take our testing to a larger scale than our internal testing while retaining as much of our ability to communicate directly with fans as possible. The game needs more hardware compatibility testing, large-scale bug hunting, and some more UI iteration before we’re ready for Steam. Also some fun stuff will be added through the process because we can’t help ourselves. When Early Access first became an option, we honestly had our doubts about the process. Some games have had issues with early access, and some have been tremendously successful both for the developers and the fans. What has become apparent is that it is a very powerful choice for games and developers that can take advantage of the opportunities. It may be the single best way to connect with the games that you’re interested in playing before they’re released, and simultaneously the best way for us to hear you. We are going to do our best to learn the lessons of those who have gone before us, and get your help in making Clockwork Empires as awesome as humanly* possible. Earliest Access is available for purchase at ClockworkEmpires.com and will be available to play on Friday, July 18th. I think I can definitively say this is the greatest news that I have had or will have in life. Why can I only buy with paypal or amazon? Argh! You can buy with a regular debit or credit card, you don’t need a paypal account. Just click on paypal and select pay with credit/debit on the next screen. I just did, it worked fine. I don’t have a paypal account. I have to say I’m surprised at the price. Is this the planned release price or will it be going down before then? We’re only releasing details for earliest access so far. The future is shrouded in the mists of uncertainty. I agree that the price is a little steep for early/earliest/unfinished access. I think you’ll find Steam customers very wary of a EA game priced like this. I thought the accepted model was to sell the unfinished game at a discounted price, and then charge full for the finished product. I realize all dev teams invest a lot of low/no pay time before any revenue is realized, but a game and it’s update schedule have to be accepted by the gaming community before justifying going above $20-$25 USD. Just look at the Top Sellers list for EA, and try to honestly compare yourselves to similar titles. Is early/earliest access going to include any Mac support? Earliest access does not include Mac support. It’s just not quite where we want it to be. We’re hoping to have it ready for Early Access in August, but we can’t promise it. Alas! But, hey, getting eventual Mac support is more than I can usually hope for, so I will not complain. Yeah — I can confirm that the Mac version is nowhere near vaporware. I wrote a good chunk of the engine in Xcode. In fact it’s running on my other monitor right now. Almost all of the issues are graphical — you really wouldn’t want to try to play it right now (if you subscribe to our mailing list there were some screen shots of the strange otherworldly horror that is the Mac graphics) . But with my allergy to all things Windows I’ve been pushing to make sure that the Mac build stays current from day 1. Very jealous of the Windows folks right now. Finger’s crossed that the Mac build will make Early Access in August. All hail the eventual Mac build! All hail the otherworldly graphics! Joyous! I wasn’t expecting any release until at least August. You should also innovate a “Latest Access” for the very last group of people to ever buy the game (sometime in the distant future of course). Not sure how that would work, but you’ll figure it out I’m sure. 3. The hell? Why can’t I download it yet? Oh well. I expect I’ll live. I just noticed Windows 7 in the minimum requirements. Is Vista definitely not supported? Windows Vista is probably Not So Good. Vista won’t be good for the current (and early access) build, or won’t be good period? I have never once though about upgrading (I have never had a good experience upgrading windows.) but if that’s the case maybe I will have to. Is it Steam only? No standalone downloadable? Currently it is steam only. to far in the future! I fyou have a time-frame please drop target date.. I wont hold you to it…. …and throw them in my monitor! And i still throwing them! 0_0 I Can’t Stop! I am perfectly ok with him saying “me money” as long as he says it in a pirate accent, which is what it is in my mind. Hurrah! Aaand…bought. Can’t wait to get my hands covered in fungus and machine oil, look forward to helping you guys find every way to crash. For the Empire! What is the current (or non-existent?) state of multiplayer? Non-existant. We’ve tested it internally in house, but it’s not ready for prime time. Probably one or two patches after Steam EA launches. Ergh. Okay, reading this I realized it’s unclear. I’ll clarify. Multiplayer: we have tested networked gameplay in house; it works pretty well over the LAN, although things like connection hiccups or whatever will bring it down faster than you can say “Selenian Fungus.” We also don’t have matchmaking yet, or NAT punching, although Ryan is doing dark magic to provide these things. As such, it won’t be in Earliest Access, it probably won’t be in Early Access (although miracles do happen), and it likely will be between one and two patches after Steam Early Access launches. A huge amount of work has been done on this; none of it is player-visible yet. Thanks for the update! Great to always have devs who engage the community 🙂 I know I will be hard-pressed to convince friends to join in until the multiplayer launches but I can’t wait to try this out on my own. Glad to hear it won’t be too terribly long after early access we may see the first iterations. OH those minimum requirements! My Core 2 Duo isn’t going to make it is it? Whoa is me. Guess I am going to build a computer just for this game. Alas my indie gaming rig has lasted for 5 years playing all the indie games, but CE is forcing me to upgrade! I have a Mac with a Windows 7 partition so I want to throw money at you now, but my Mac is my more used system. If I buy it now with Windows would I have to pay again for the Mac version when it comes out? Best tags, or best tags? I’ll admit, I’m a sucker for Inception references. So I’m biased. Looking forward to seeing the game! Is there any ETA on the exact time the game will become available on Friday? Never have I bought something so quickly. Will there be a set time where the price might drop? 30$ isn’t exactly a deal-breaker, but this early in development it’s definitely a deterrent. Can’t wait to see how this turns out though! What work? You get the game to support the developers and see the game get developed first hand. So I live in Australia, which means it’s going to be Friday much earlier here than in, say, California. Actually, Friday is only 16.5 hours away for me. My initial thought is to skip work tomorrow, but I have a feeling that I won’t really have access until Saturday. No need to apologize. After two years living in Oz, I’m used to being completely overlooked by everyone. But you DO have some of the largest spiders on land, so there’s that. Maybe you guys can add Giant Australian Land Spiders as an apology. How bout an “Australian difficulty mode” where every single animal is either deadly poisonous, weird, or a sheep. Will the Earliest Access game be moddable in anyway? LUA files open to editing or some such? Older blog posts said there would be no always-online requirement; does this mean that a non-Steam version will come later in development, or does Gaslamp not consider Steam to be “always online”? We’ve never used steam for DRM. If you have Dredmor, for example, you can run the game from inside your steam file directory without steam running. That said, steam is only *currently* the only way to get Clockwork Empires! It would be nice with the mods in Clockwork Empires if the mod structure was consistent between the Steamworks and non-Steamworks versions. Will you make another announcement via the email list when the Mac / Linux versions are available? So, can I make a local bloodbath in my settlement due to cat of one settler killed by accident? My thought was: hmmm, 2 beers, or FREAKING CLOCKWORK EMPIRES…. Fudge yeah i choose Clockwork Empires. Great news, I have been following your progress on SteamDB for Linux. Good to know that support for Linux is coming soon. I know your pricing has not been fixed, 30 dollars is a lot of money, but fair game I suppose for Early Access. $20 dollars is a sweet price point for a game like yours once it is out officially, but I am sure you could get away with selling it for more. I now have a powerful and UNEXPLAINABLE urge to take Friday off. Just for clarification If you don’t mind; When on friday can I look forwards to start enjoying enjoying this fine game? In the middle of the night just after Thursday ends? Normal office hours? Well I know what I’m buying tomorrow for myself for my birthday 🙂 I will buy this early because I want to support you guys to make an awesome game. any time frame on friday when the game goes live to download?